We hate Telstra...they have been ripping businesses off for years on costly ISDN lines. Whats more their call rates are ridiculously high. And it keeps getting worse! Many customers over the last few years have been hit with increased charges for their ISDN services. This seems crazy for a 30 year old technology (yep its ancient...developed in 1988). For instance one client of ours (and a not for profit I might add!) has had three price rises in two years and are now paying 30% more per month just for their lines. Telecommunication companies who resell ISDN services for the phone systems they provide (PABX's) haven't been doing anyone any favours either. Using Telstra's ISDN connections they have encouraged businesses to install costly PABX systems. While these systems are functional they generally are hard to configure and maintain which keeps businesses locked in. Granted, a few years back ISDN and complex PABX's were pretty much the only option for businesses. But it's 2018, surely there's a better way? Turns out there is...VOIP (Voice Over IP). Are VOIP Phone Systems An Option? "VOIP...no way!" I often hear. I know you may have heard some bad things about VOIP but VOIP technologies have been around for years . While there are still some people that implement it poorly, today it is a solid, proven technology that basically every large corporation and telco are using (including companies like Telstra, Optus, Vodafone). In fact the reality is that every home phone in Australia will be using it once the NBN has rolled out (already around 4 million are using it on NBN) and you probably use it everyday on apps like Skype, Whatsapp, Apples FaceTime, etc. So why should you consider switching to a VOIP solution for your business? This is one of the biggest reasons businesses switch. The cost saving is crazy! Many are paying $88 per ISDN line (sometime plus $13.20 for caller id). On the VOIP solutions we provide this is generally $6.60, sometimes even less! Most businesses see around a drop in call cost of between 50%-80%! And it keeps gets cheaper. Yep you read right...over the last 5 years call rates have continually dropped and are expected to continue. Contrary to what you may have heard VOIP solutions (well the ones we sell) have a better call or voice quality than traditional phones. Traditional phones have a Hz range of around 3000Hz but VOIP solutions have around 7000Hz. This gives you a far richer and more natural voice quality...many comment "it sounds like they are sitting next to me". Our VOIP solutions generally run on an offsite PABX server (unless you want one onsite) that you access via the web. So rather than spending $1000's on a magical box on the wall that no one knows how to configure (except your overpriced Telco provider who now has you by the short and curly's) you have a nice, usable interface that allows you to even make changes yourself anywhere in the world. Have someone working from home? As long as they have an internet connection they can receive calls on a handset or computer just like they are were the office. How awesome's that...take that call in your pyjamas or even better sipping a pool side cocktail in Bali! New staff member? Just add them in your control panel, plug the phone into the network and away you go. New office opening up? Buy the number you want, Aadd the new users in your control panel, plug the phone in, new office setup! Whether you need 1300/1800 numbers, missed call notifications, digital fax services, queues, custom on hold music, time switches, busy lamp field, remote call pickup, call spying, call parking, voicemail, ring groups, IVR (auto attendant) we can do it. We haven't yet found something we can't do. New features added regularly. All the handsets top quality and support the VOIP standards which means you're not locked into our system or even our type of system. You can use the handsets basically on any provider in the world. So if you find a better deal you can move the handsets to a new system by simply changing three settings, the servername, username and password. One client of ours would regularly loose their two ISDN services stopping all phone calls in and out of two businesses. Poor quality lines, outages and lengthy wait times for fixes are seeing many businesses wanting to get off the copper ISDN network. Reason is Telstra's copper network is falling apart and its starting to show. 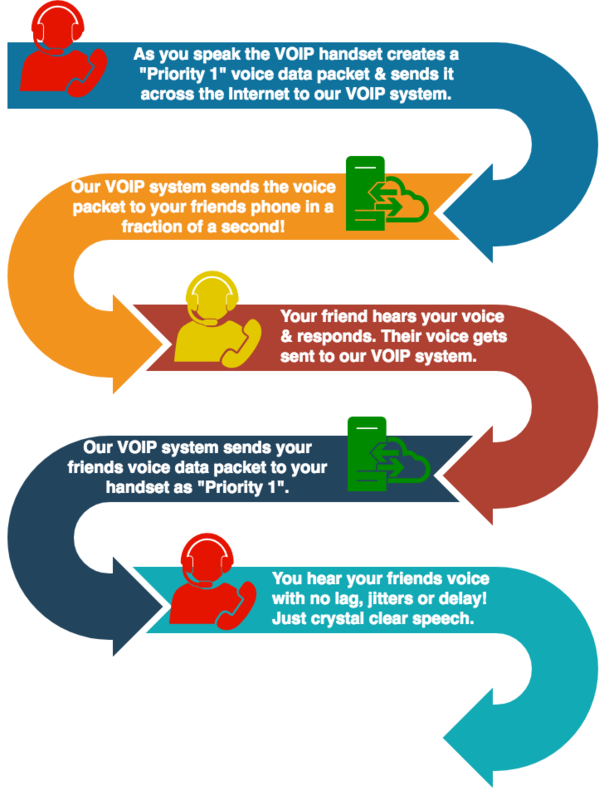 With VOIP solutions you bypass all these issues. Installation of a VOIP phone system is quick and easy. Whats more is it is extremely cheap compared to traditional PABX system. You're not locked to a specific handset brand or model. In fact you don't even need a VOIP handset! You can receive & make calls on your mobile, computer, tablet or a combination of devices. A lot less than you think! Prices start at $12 per month and quality VOIP handsets are $110. We have access to top quality refurbished handsets that can save you heaps. We also offer instalment payment plans on VOIP handsets to assist you with setup costs but the minor outlay quickly pays for itself as most customers drop their monthly costs by 50-75%. Contact us for more information.